Oak can live for over 500 years. Coppiced specimens may reach 1000 years. Many old oak woodlands in Northern Ireland are under protection to ensure that this very important natural habitat remains for the future. 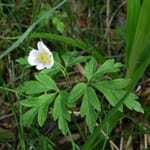 Upland oakwoods are subject to a habitat action plan as part of the UK Biodiversity Action Plan (UKBAP), recognising this type of habitat as one in need of immediate attention. One of the main threats to our ancient oakwoods is their isolation. The leaves are dark green above and lighter below. Leaves of pedunculate oak (Quercus robur) appear about a fortnight earlier than those of sessile oak (Q. petraea). There are physical differences in the shape of the leaves too. Pedunculate oak has a short leaf stem and 2 ‘earlobes’ at the base of the leaf. Sessile oak has a long stem and is missing the ‘earlobes’. Male flowers (catkins) appear together with the leaves in late April and early May. They are yellow-green in colour. After this, the new shoots appear carrying the female flowers, which are very small and inconspicuous. The flowers are wind-pollinated. 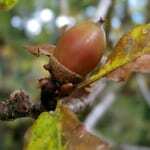 The fruits (acorns) ripen during late October. The acorns are mostly in pairs, each in a ‘cup’ and are borne on a stalk. On pedunculate oak this stalk is long (maybe 10cm). 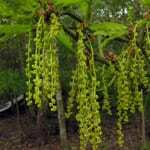 On sessile oak the stalk is only 1-2cm long. 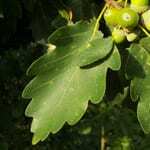 The two kinds of oak native to Northern Ireland are easiest to distinguish when the acorns are present. 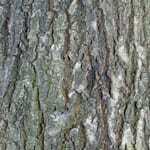 Young plants have a smooth, shiny bark, which varies from brown to grey in colour. It turns much darker with age. The creases in the bark provide shelter and home for insects. The trunk can grow to be 3m or more in circumference. Each year as an oak grows, it makes two growth rings. One is the spring wood which is lighter. The summer wood is darker. The rings show the age of a tree and help us to understand the climate conditions at the time it was growing. Pedunculate or English oak is tolerant of extremes of climate. It grows on soil which is rich in nutrients and not too acidic. It is a thirsty tree and needs plenty of water. It grows in valleys, near to rivers, and on damp, moist land. 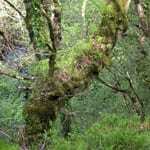 The sessile or Irish oak is a more modest tree. It grows up in more acid and poor soils. In contrast with the pedunculate oak, the sessile oak is not tolerant of flooding. Oaks is a tree that can form an important component of a wood. Oakwoods are bright, letting sunlight through, providing good conditions for other plants like grasses, herbs and shrubs.